* Item dimensions: 8cm x 8cm x 2.9cm / 3.14" x 3.14" x 1.14"
* Package dimensions: 18.5cm x 11.2cm x 5cm / 7.28" x 4.40" x 1.96"
★【Wireless Charger and Power Bank Design】Wireless Charging Support all QI-enabled phones for inductive charging at ultimately astonished speed! Truly cable-free utility, tangle-free operation. Wired Charging Support all Smartphones and other Smart Devices. ★【Large capacity with SAFE CHARGING】you can charge up to 4 devices at the same time with 6700mAh large-capacity rechargeable battery; Support over-current protection, over-temperature protection and over-voltage protection. 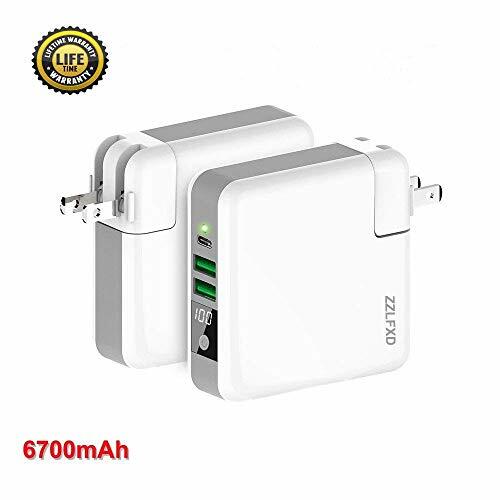 ★【Convenient and portable design】 Lightweight compact size convenient to carry, folding type AC 90 - 240V input voltage can also be used overseas, making it ideal for business trips and traveling. ★【Smart LED Digital Display】Give you easy look at the remaining power with the intuitive number so that you would possess the better using experience. ★【What You Get】Our 4-in-1 Wireless Charger Power Bank, detachable AC Plugs US and User Guide and 2 years warranty.Any quality problem, please feel free to contact us, we will do our best to providing you a pleasant shopping experience. If you have any questions about this product by LFXD, contact us by completing and submitting the form below. If you are looking for a specif part number, please include it with your message.